At least 10 people have been killed in two separate attacks in the Pakistani city of Peshawar. Six were killed and about 70 injured when two bombs exploded at a busy market, police said. Shortly after, a suicide bomber attacked a military checkpoint on the city outskirts, killing four soldiers. The attacks came hours after Pakistani Taliban warned of further violence following a gun and bomb attack in Lahore which killed at least 24 people. 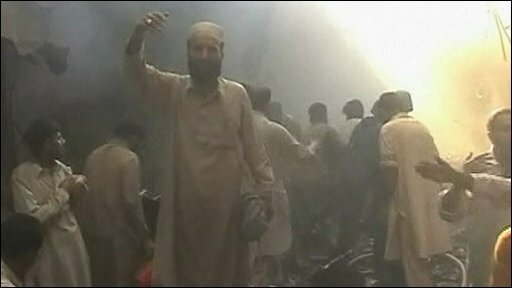 In the initial Peshawar attacks, bombs were on two motorcycles and detonated by timers, bomb disposal squad chief Shafqat Malik told reporters, according to Associated Press news agency. Tahir Ali Shar, a resident of the Peshawar, told Reuters news agency he could see about 15 wounded people lying on the ground. Shops and vehicles were damaged and television images showed men trying to douse flames, while injured people were being dragged out of the market to safety. "It was a sudden blast and then there was fire all around, a cloud of smoke filled the sky," injured shopkeeper Khair Uddin told Reuters news agency. Gunmen started shooting in the narrow alleyways as police arrived. Police later said two suspected militants had been killed and two arrested. 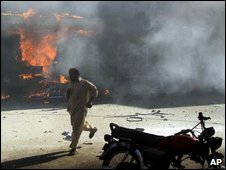 While the gunfight was going on, a suicide bomber drove a car laden with explosives at a military checkpoint on the outskirts. The apparent co-ordination of the attacks, coming so soon after Lahore and the Taliban warning, could herald a new wave of violence in Pakistani cities, says the BBC's Barbara Plett in Islamabad. Also on Thursday, a bomb killed at least three people and injured several in the town of Dera Ismail Khan, about 186 miles, (300km) south of Peshawar. • On 16 May a car bomb exploded in the densely populated Kashkal area, killing at least 11 people and injuring many others. The attack in Lahore a day earlier was in response to the army's operation in the Swat valley, Taliban deputy Hakimullah Mehsud told the BBC by phone. Hakimullah Mehsud, Taliban commander for Orakzai and Khyber tribal regions, called on citizens to "evacuate their cities"
He warned of further attacks on "government targets" in the Pakistani cities of Lahore, Islamabad, Rawalpindi and Multan. Are you affected by the issues in this story? Send us your comments.